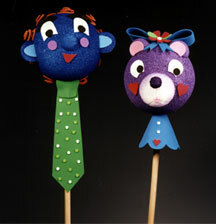 Giant fantacy stick puppets makes any day a fun day. And with the help of Kathleen George you can make it in four easy steps. Wooden dowel, 7/16" x 30"
Insert skewer, pencil or chopstick in foam ball to use as handle. Paint foam ball color of your choice. Let dry. Place head on large mouth jar and get ready to decorate! Blue puppet sports spiral hair cut from orange craft foam; ears made from a foam ball cut in half; a nose made from a foam ball; and mouth, cheeks and eyes cut from craft foam. His green tie is made from craft foam and decorated with foamie polka dots. The purple teddy bear has a muzzle, nose and ears made from foam balls; her hairbow and collar made from craft foam, as are her eyes and cheeks. Hair: insert pieces of yarn, drinking straws or chenille stems into top of head. Eyes and nose: Cut from craft foam or construction paper, or glue on foam balls, wiggle eyes, candy cups, buttons, pom poms. This craft project was featured in 13 Kids Crafts for Father's Day. See them all here. Lindo y facil de hacer. Gracias!! !